Shimano compatibility charts come in handy for assembling your bicycle, planning purchases, or troubleshooting. We have included their compatibility charts from 2007 here as well as notes to these charts. The Japanese Shimano site has proven the most handy on charts. For 2007, the original was not in a presentable format, so it has been reformatted for this site. Get the latest compatibility chart from the US source directly. Shimano site charts available right here. FC5603 crank limitation For compatibility with front derailer FD5603, the FC5603 Shimano 105 crank should use chainrings of 50-39-30 tooth sizes. 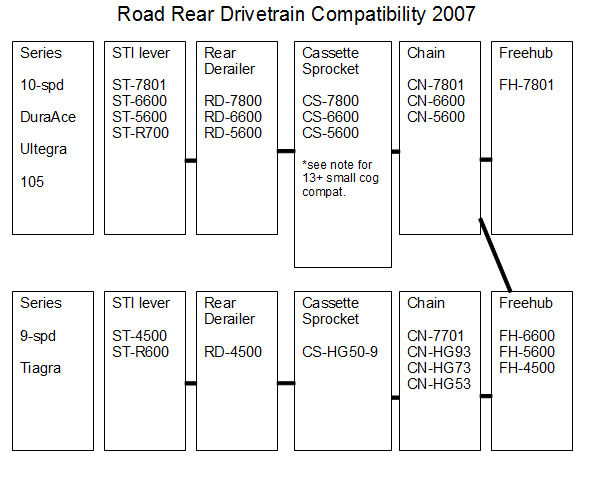 This is in Shimano charts for Front Drivetrain, 2008 and 2009. This likely indicates a limitation in the front derailer capacity, but I don't know why the Ultegra FD6603, which has capacity for the standard 52-39-30 tooth ringed Ultegra triple crank, would not also support the smaller toothed 105 crankset. There is no compatibility shown for this combination in any of the charts. Rear derailer capacity limits For Details, see derailer capacity table. Shimano charts provide for an exception to the compatibility rules between cassette sprockets and rear derailers. Specifically, only the 7900-, 6700-, and 5700- series rear derailers have sufficient capacity to support a cassette with sprockets differing as much as 16 teeth or more from small to large cog. For this reason, the 11-28 tooth cogset (17 tooth difference), available in 7900-, 6700-, and 5700- series is not compatible with the older series rear derailers. 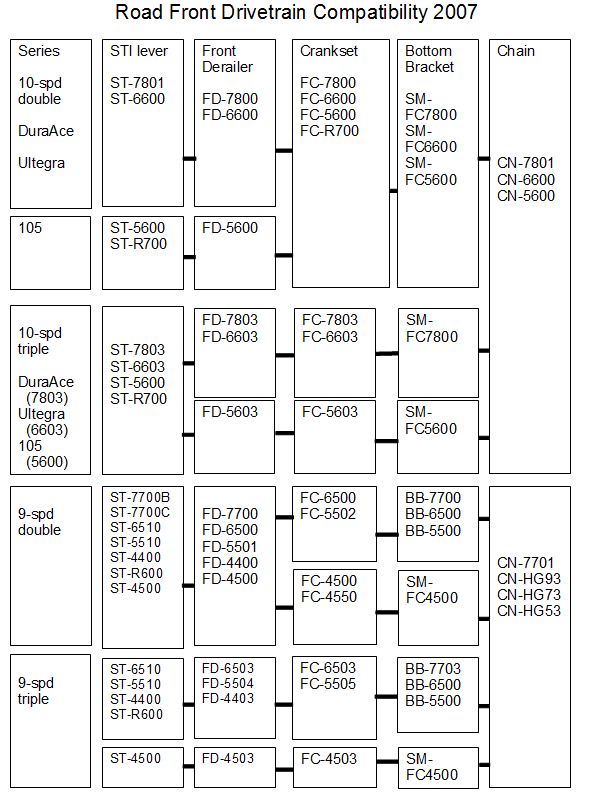 The 11-27 tooth cogset, only available in 7900-series, has the same limitation. For the older 10-speed derailers (7800-, 6600-, and 5600-series), the maximum cogset tooth size difference supported is up to 15 teeth (as in the 12-27 size). Junior sprockets with 13 or more toothed top gear A difference exists in cassette sprockets labeled CS-6600 which are for "junior gearing". Do not use the "junior gearing" CS-6600 sprockets with normal freehubs - they do not fit. Junior gearing CS-6600 sprockets can be identified as having a top gear of 13, 14, 15, or 16 teeth. The normal size sprockets, which are compatible with all normal freehubs, can be identified as having a top gear of 12 or 11 teeth. Another important difference exists with the junior sprockets: their spacer requirements differ. Riders planning to try one of the sprockets with top gear 13 or more teeth - research this part carefully. Other riders can safely follow the compatibility charts for your planning. Finally, do not use one of these junior sprockets with a triple front chainwheel -that combination is not compatible. Shimano 105 ST-5600 Triple Shifter Change The 9-speed 105 front (left) shifter (model ST-5500 or ST-5510) is compatible with both a double or a triple crank configuration. Shimano's move to 10-speed cogsets initially started out like this: the 105 front shifter (left, ST-5600) was compatible with both a double or a triple crank configuration. But Shimano saw a large number of warranty claims due to breakage of the shifters caused by improper setup early on. Their response was to introduce the double-only compatible ST-5601 and the triple-only ST-5603. Ultegra and Dura-Ace already had the double-only and triple-only shifters. So, an ST-5601 left shifter is the only one of the 10-speed 105s which is not compatible with triple cranksets. ST-5600 or ST-5603 are good for triples, and ST-5600 is actually a little more prone to damage when setup for double cranks.